The linear models of many consumer goods supply chains are now shifting towards consumer-led, data-driven, highly complex supply networks. The consumer increasingly drives innovation from the heart of the network, demanding mass product customisation, more accurate synchronisation, and faster multichannel retail responsiveness. Going far beyond the abilities of the typical workforce and infrastructure, these shifts require instant visibility, quick decision-making and increased flexibility. 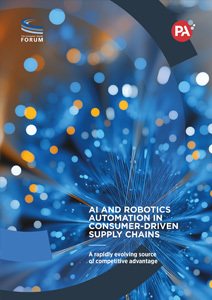 Artificial Intelligence (AI) and Robotics automation have the potential to overcome these challenges and revolutionise consumer goods supply chains. For organisations willing to embrace this inevitable evolution, AI and Robotics automation will enable innovation, ensure optimum service levels and deliver growth at low cost. It will become a major source of competitive advantage. To help consumer goods manufacturers and retailers navigate this opportunity, we’ve produced this research paper for The Consumer Goods Forum’s End-to-End Value Chain Learning Series. We explain the various AI and Robotics automation technologies, give examples of companies that are successfully applying them and answer your key questions. What is AI and Robotics automation? What disruptive consumer trends are driving its evolution? How will it impact the workforce? How can my company take it forward – or go further?